What about the Apps already installed? It’s not easy to get the user’s Apps by doing web searches, the only existing connection between their Apps and the web are the query results that point to listings in the Google Play Store but not much more than that. Now, assuming that a service exists both as a website and as an Android Application, when the users search for keywords that should guide them to the concrete App, they will find themselves opening the website version of the service instead. This results on longer loading times and an overall worse experience. Wouldn’t it be better to directly open the content on the App? Yes. Both technologies, mobile and search, are living together yet disconnected within the same device and the App Indexing is the way to unify them. 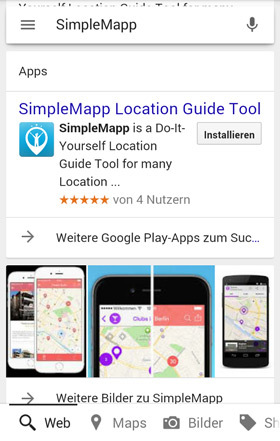 What does „App Indexing“ mean? It is true that Google automatically generates an index of the Android Apps listed on the Google Play Store and shows them as search results, but the real App Indexing allows the user to seamlessly connect pages from your website with specific content within your smartphone App. 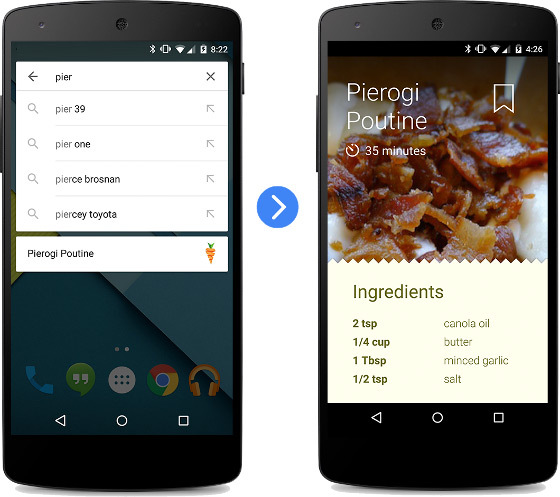 This enables smartphone users who already have your App installed to open it with the content they desire directly from the search results on Google. After all the hard work that pushing an App into the market means, you’ve achieved to create an unique service with a delighting experience that makes your users happy. Bravo! But still, with the time, users might not be frequently coming back to use it, or they might even forget about the existence of your App and stop using it. But it might as well not be your App’s fault not to be fully used, some users may not be conscious that your service offers the exact solution that they’re looking for, at the precise moment in which the need for your service comes to them. What a shame for great Apps like yours not to be used to its full potential! This is when all the power of Google comes to work for your advantage. When a user is googling for terms that are directly related to your App, App Indexing helps you drive usage of your App instead of your Website by making your App more discoverable and accessible directly from the results page. 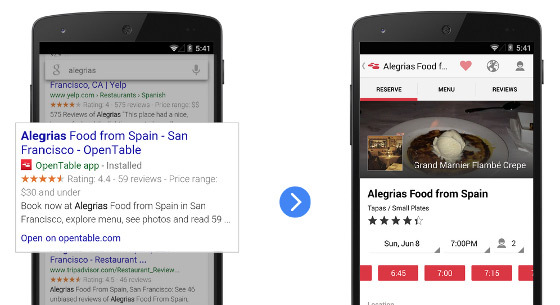 Deep links to your App and the “Open in App” call to action appear in the Google Search results on Android so users can get to your native mobile experience quickly and easily by directly accessing content within your App, when you decide it appropriate. Yes, you can also control which content to open on your App and which on your website, to always provide the best experience and highlight the technology that fits that specific situation and content better. The Google Autocomplete function is also available for you, allowing users to easily re-discover content with which they’ve interacted before. This and the other App Indexing function surface your App’s content on the Google Search App and the browsers on Android if the user is signed in. In order to implement the App Indexing, the content requires two front-end representations that can later be linked: the first one as a Web App and the second one as an Android App. The method to unify them is called Deep Linking and it specifies which content is the same between a page of your website and an activity of your App so the Android OS can relate them when a specific search result is clicked. On the website, the webmaster specifies this using “<link>” elements in the the “<head>” section of the pages and on the mobile side, the details are specified on several “<intent-filter>” elements, which are actioned using the Google App Indexing API and the Google Play Services. At the present time, due to technical limitations, the Google Indexing is not available for the iOS platform; but Apple offers an alternative to this through its Spotlight Search. 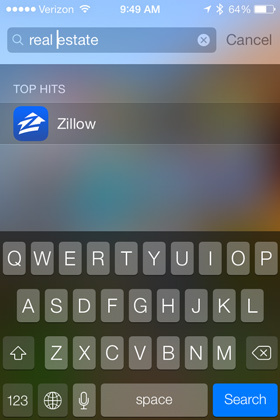 This alternative is that Spotlight reads the full title that each iOS App by the AppStore has and shows the indicated App when related terms are written on Spotlight. This allows the users to open the Apps he or she wants faster than manually looking for them, even if they don’t remember the specific name or folder location at the moment. Unfortunately, a deeper linking or integration with the Operating System is only possible for the Apps that Apple itself ships. Even after all the work that putting an App into the market means, a good product is not enough if people cannot find you or they forget about the functions and services that your app provides. The automatic Indexing of Apps on the Play Store helps us to get discovered by new users and begin to serve them, but still, being on the Google Index is not enough. We have to do more. The extra step to make sure that the users will find our App when they need it, when it’s more meaningful to them is the App Indexing. If you have both web and mobile presence and you want more control over how your content is accessed from search to greater delight your users and to be perfectly integrated into their device’s search functions, the Indexing API by Google results very important for you and us.